Good Bones: Part I of Philadelphia Quaker Land-Grant Tour « John Bartram Lives! I was in the countryside yesterday experiencing the change of season. It’s early for us to be recognizing trees by their flowers. Magnolia spp. and Prunus of all types were pushing color through the tight shells of buds and displaying to us an early spring. 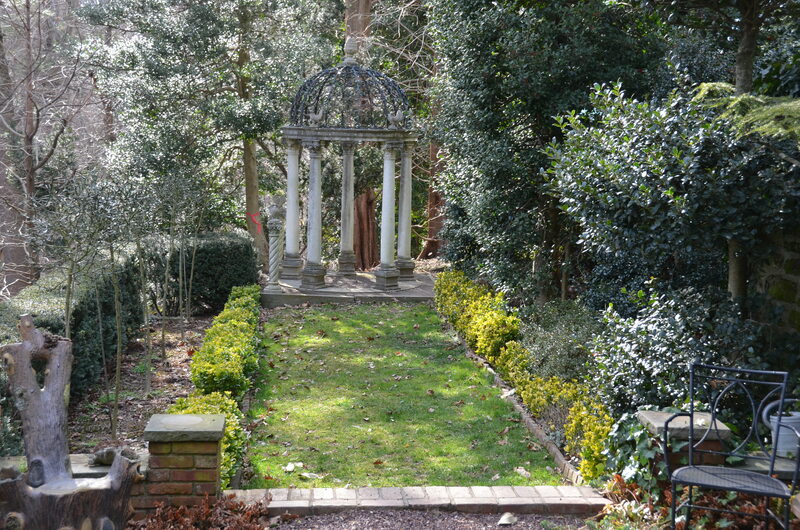 A Folly creates the focus of this very linear garden room. 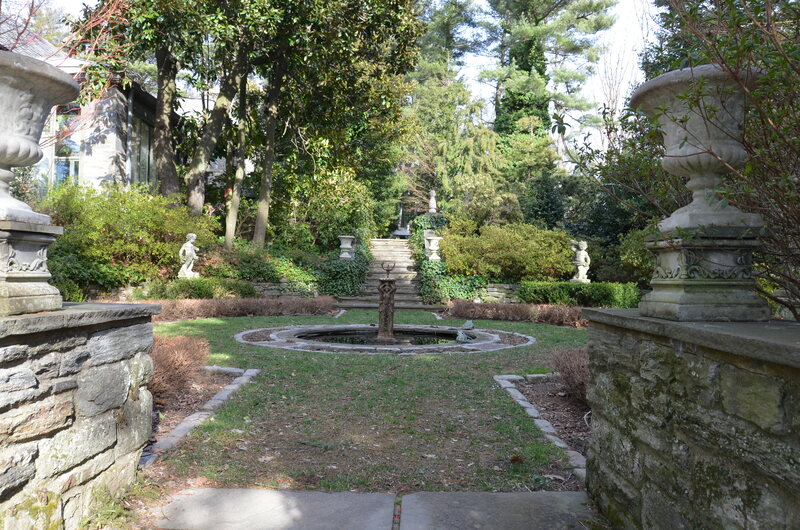 I was touring with a good friend who was here for meetings related to the grand and glorious Philadelphia Flower Show. It was she who whose day it was to prod this old man into action. 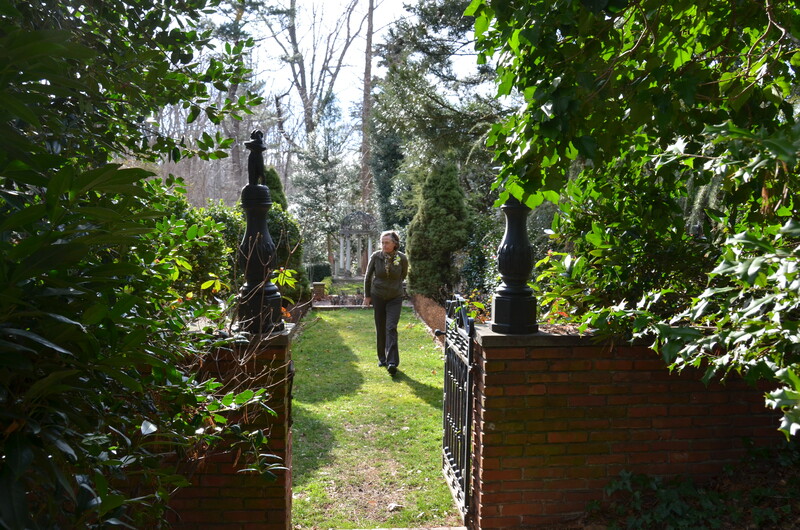 She had an agenda and organized the day around farms and gardens that she wanted to view. 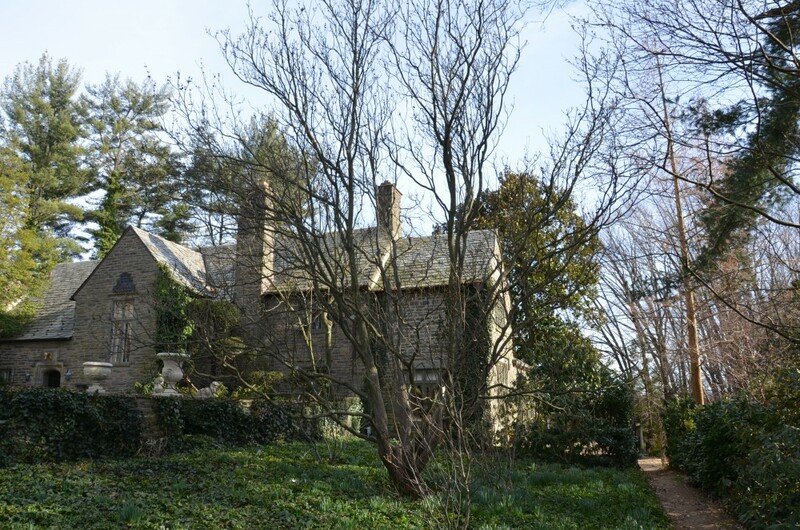 Mistress Nancy Buley was the reason for touring broader Quaker land grants of the Philadelphia environs. The first was Meadowbrook Farms. 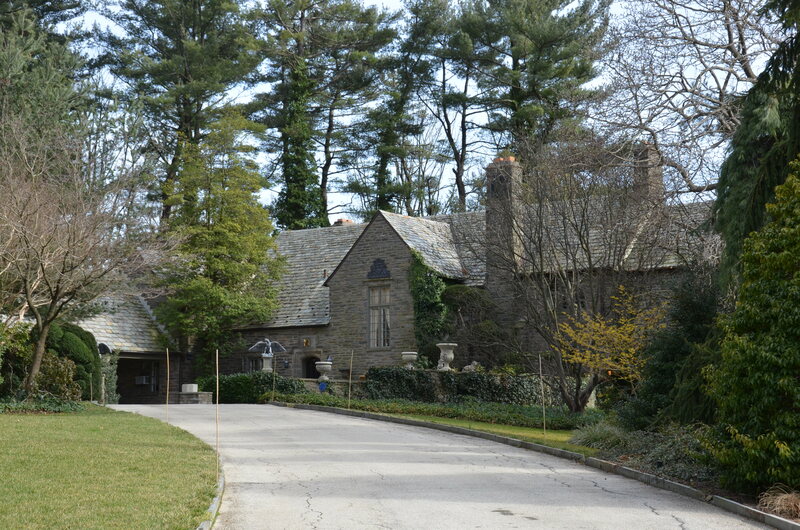 It was the manor house of G. Liddon Pennock Jr. I’m told that it was designed in the manner of a home in the Cotswolds, England. I wouldn’t know. I have never travelled there. But it looks older than its 75 years. Mr. Pennock and his wife, Alice, appear to have led a golden life. They were gifted the land on which their house and garden grew by her parents. Their parcel of 150 acres was cut out of a demesne of many thousands that went back to the time of the original Quaker settlement. This is the Cotswold Manor House constructed by J. Liddon Pennock. It's an English country cottage. Lovely house with garden views from every room. Oh, I didn’t mention that Mr. Pennock was Quaker. So, of course he was also very intimately involved with the world of Horticulture in this hot bed of botanic discovery and display. The gardens that surround the house are the main reason for my interest. Most especially, the magnificent Franklinia that rises majestically in a bed all to itself next to the forecourt. It is perhaps the best representation of the species that I have ever seen. As you know, I have seen quite a few. Next to the courtyard is the magnificent Franklinia alatamaha. It's largre size and advanced age is being backed up by the three smaller trees that ring the central masterpiece. But Mistress Nancy and I continued to walk around the grounds. She represents one of the world’s largest growers and sellers of trees. J. Franklin Schmidts in Boring Oregon is a nursery built on my original model of shipping small slips, twigs, bare roots, and starters to a world of those nurserymen eager to grow them up and plant them on. 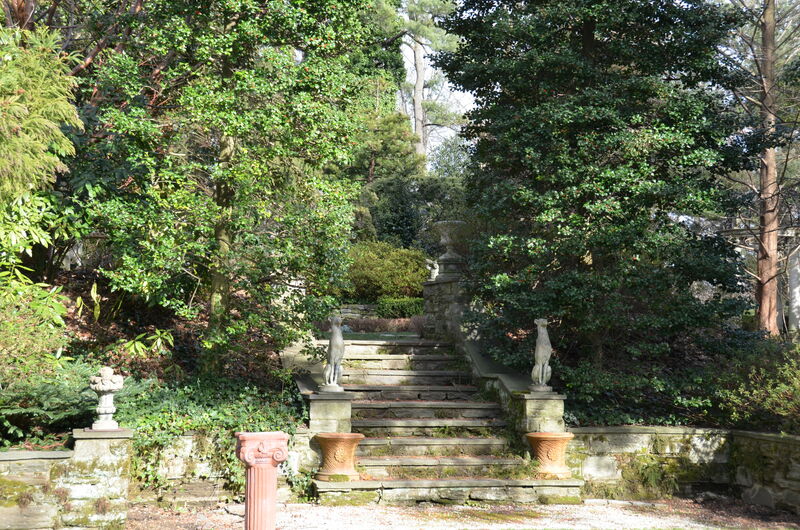 The grand staircase leads to the wonders of the many garden rooms. 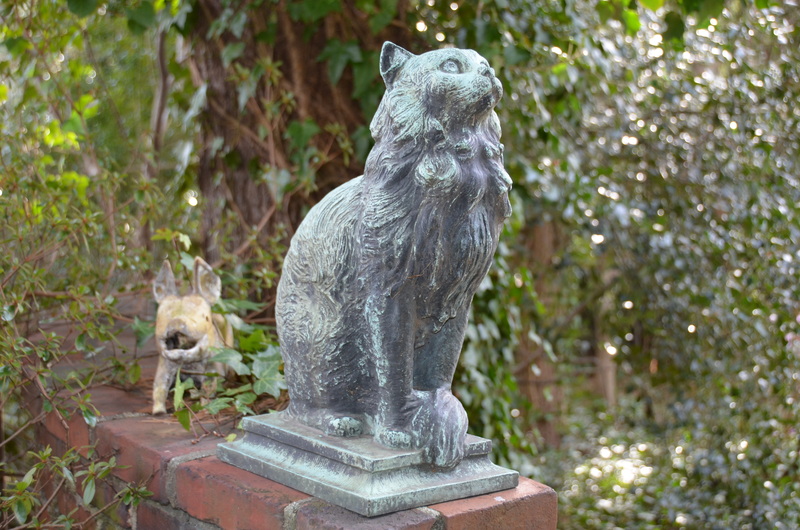 Animals abound in stone, terra cotta, bronze, steel, and concrete. She is as aware of the trees in a garden as I am. She is keenly interested in the choice specimens that were on display in the elegantly articulated garden rooms. Mr. Pennock crafted a beautiful series of spaces set apart by hedges and terraced into a hillside that falls away to view the rolling mountains in the distance. It’s a statement of tranquility and perfect, human scale. It was delightful to see the shape of the spaces without the distraction of floral color, sparkling noisy water from the fountains and the showy abundance of summer. We went to the garden in this early spring to see the bones. And they were shimmering and ghostly. A contorted pair of Tsuga in the Eagle garden was pruned and tormented over many, many years to within inches of their wondrous lives. 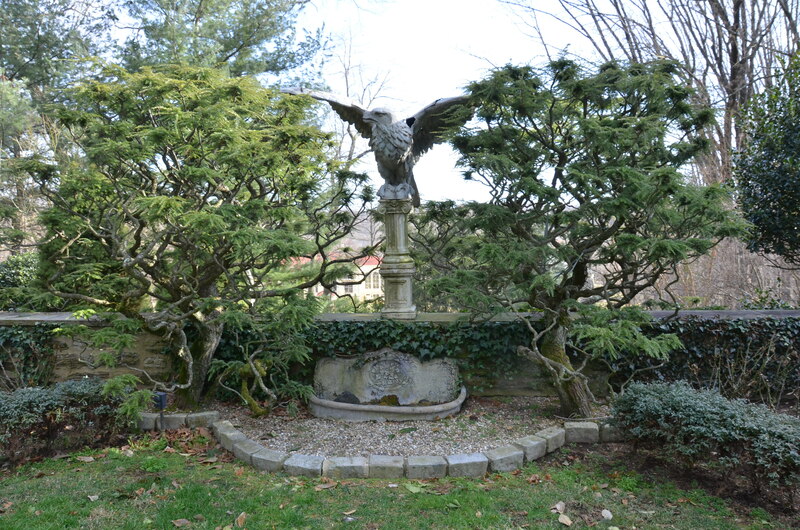 The eagle garden with flanking Hemlocks pruned and formed into a unique cloud of evergreen. The evergreens were in accumulated abundance: Ilex, Chamaecyparis, Pinus, Laurels—both broadleaved and small—and Camellia. The Camellia is a Chinese plant that was introduced to the trade by Lord Petre’s gardener, James Gardener. You’ll remember that Lord Petre, Thorndon Hall, Essex was one of my most passionate and dedicated correspondents until his untimely death in 1743. Camellias are members of the family of plants that also include tea. And where would we be as a society without the calming benefit of that elixir? 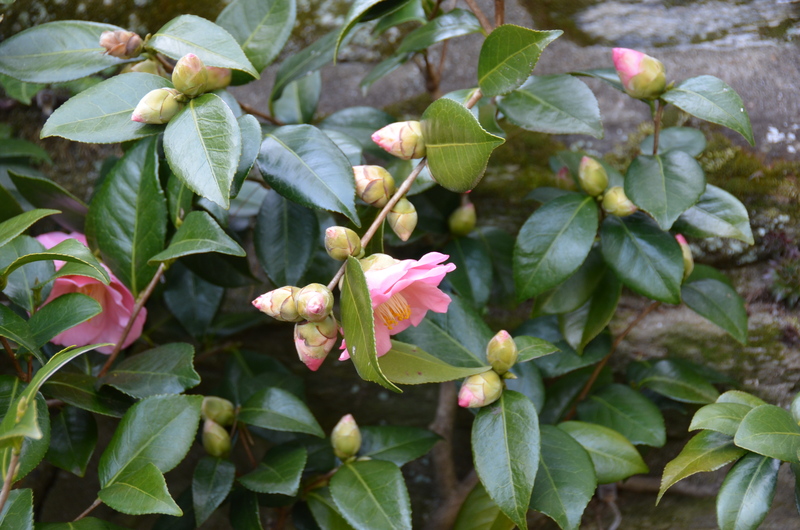 The camellia was in bloom on a south-facing stone wall. Several plants were unknown to me in the days of my earlier travels. But I have taken to them as if they were of my own discovery. 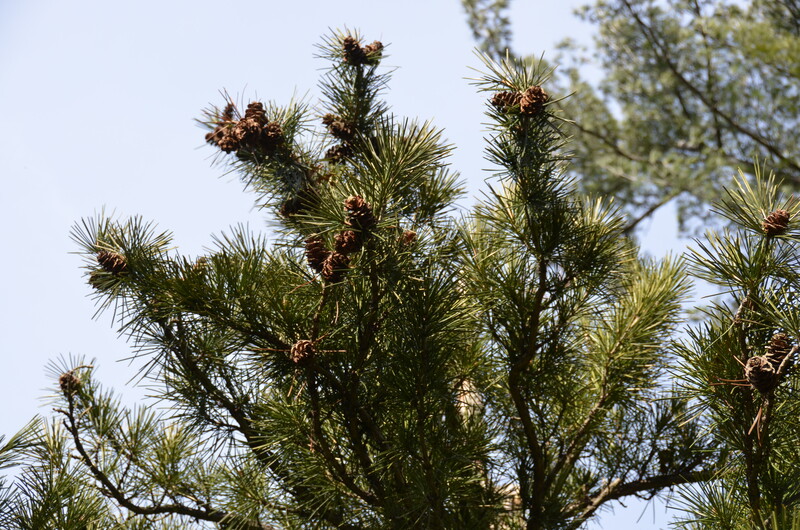 Sciadopitys verticillata has been given the much more descriptive name of Japanese Umbrella Pine. The specimen viewed yesterday was so aged that it had successfully produced cones. Amazing. The Sciadopitys verticillata was showing cones. 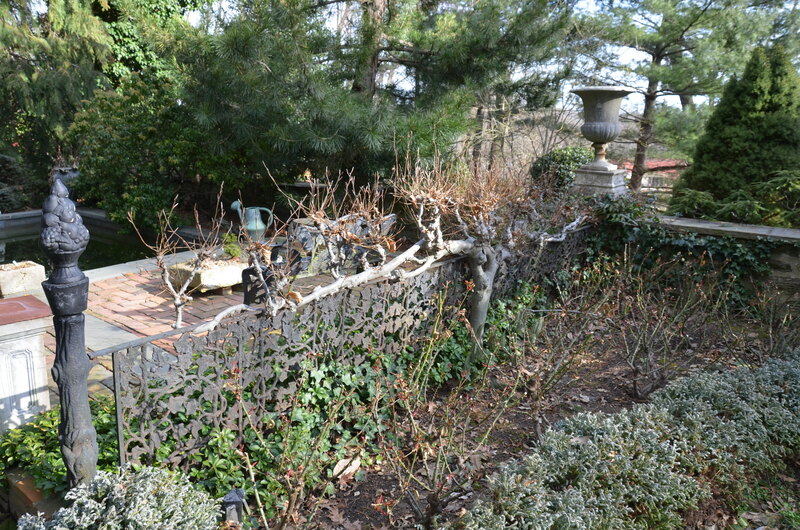 A pair of espaliered Beech trees had grown so old that their branches had begun to overwhelm the iron fence that supported them. Intriguing. 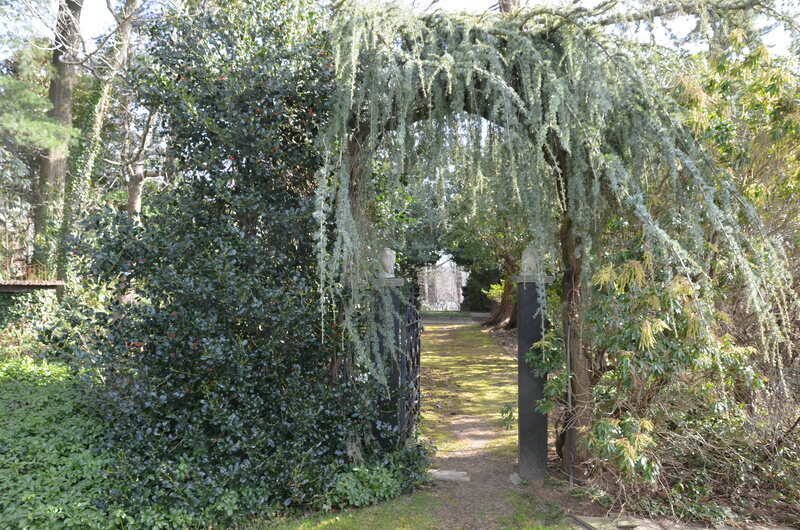 The beech was espaliered on a 19th century piece of wrought iron. Just as intriguing was the collection of carved animals. In all sizes. In all the various poses of life. In all of the diversity of nature. Cats. Birds. Rabbits. Horses. Mice. Pigs. The menagerie was frozen into poses that echoed the ghostliness of the empty spaces. More bones of a garden out of its season. 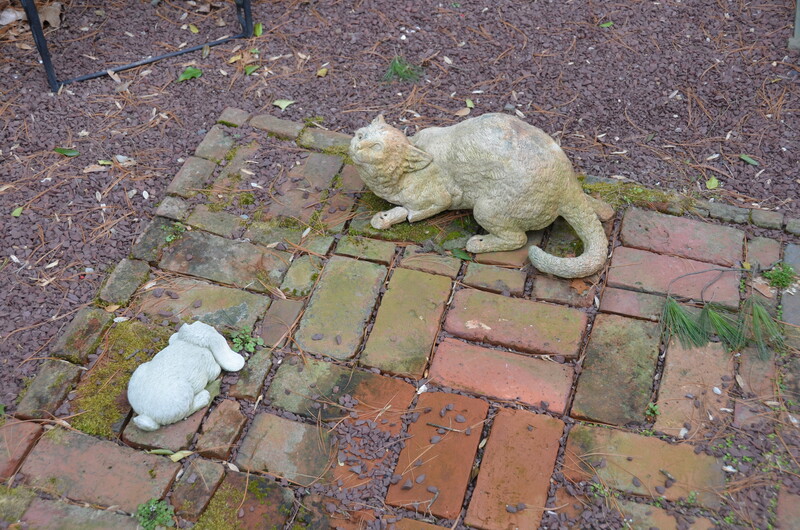 The rabbit and the cat play out a dramatic scene from the likes of Aesop's Fables. We experienced much more than we saw. The day had a cold edge that kept us moving quickly through the spaces. There was a dimension of a golden age and a stylish life alive in these Allées. We felt the warm summer nights that had movie stars laughing with scions of capitalist enterprise. Those ghosts were gathered in beautiful clothes glittering with gems that echoed the brilliant stars in the distant sky. A ghost of a garden entry. Good bones. Haunting and haunted space. A garden that I can experience with my own sense of history and my own ghost-like appearance on an early spring’s magical afternoon. Our hosts for the final tour of the house were John Story and Diana Wiener. They have taken care to preserve the ghosts of this world by remembering the life of the owners in the stories of the details. The estate was indeed magical! Thank you for sharing the day, and the enchantment of Meadowbrook, with me. Ah, Mistress Nancy, it was only an old man’s pleasure. We had a day and a storied moment that needed to be shared. Blessings.